There is no where in my house or even my car for that matter where you will not spy a random sticker. 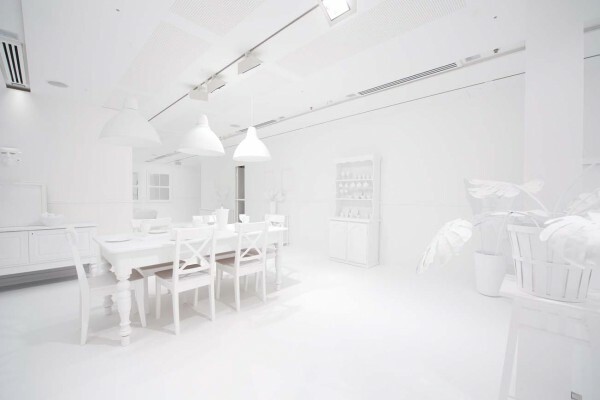 The wall, mirrors on tables. No matter how many times we tell Ava that stickers stay on paper she just cannot help herself. So when I saw pictures from the newest exhibit at the Queensland Gallery of Modern Art I was enthralled. 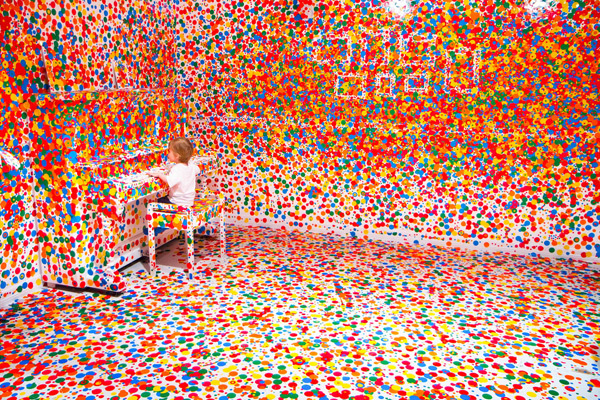 The artist created a completely white living space and gave thousands of kids thousands of stickers. Now, if only a local museum would steal this incredible idea Ava would be a thrilled and willing participant! Ava is not a willing artist. Sure she will paint and color but the task is over almost before it began… very short lived. I fear she will be the student that the teacher gives a coloring sheet and 1o seconds later she says, DONE! Not that I believe in coloring sheets but those kids used to totally frustrate me… TAKE YOUR TIME!!! Now I have got one! 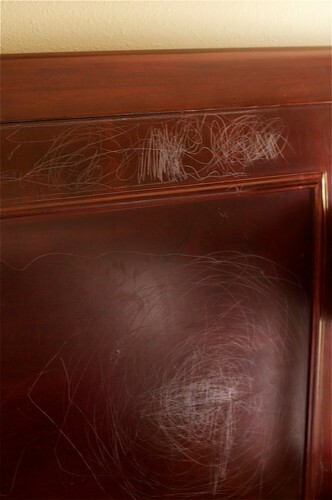 Well the other day during nap time or quiet time in this case she decided to become an artist. I am pretty sure this is her most extensive piece of art yet. The most detail and time in… To look at the bright side it did all come off and perhaps Ava has a little artist in her after all! Yes, it is crayon. No, crayons are not normally in her room. 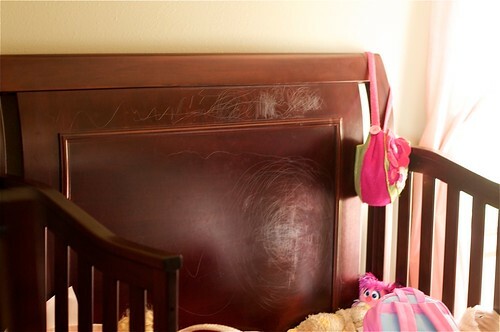 No, there are no more crayons in her room... EVER! It was so much fun to put three year olds in front of a canvas. Endless possibilities… Right now Ava is in a mix all the colors together phase creating a lovely shade of brown. Still I love her masterpiece. I decided that it would a great idea to give her the same size square canvas every year on her birthday and document the artistic changes. Plus I think they would make a wonderful wall display all put together someday!!! I just love a good idea! I love children’s art work but over the years I cannot imagine how it will add up. There may be several ways to display art work in your home but storing it is another matter entirely! I once came across and article from Martha Stewart that described using poster tubes, marking them with the corresponding year, rolling the saved art and storing in a big basket. The child could even decorate the tubes as an additional project. It seemed attractive and organized but having taught young children art for several years not practical. So much of children’s art is three dimensional, noodles, yarn, popsicle sticks, clay artistic mediums that despite your best effort cannot be rolled. Of course large flat boxes can now be found at most stores and Storables has non plastic versions if you are concerned with aesthetics. Storage however does just that, it may help the art to be preserved but not easily enjoyed. I finally found a truly fabulous way to preserve and enjoy children’s art for years… Artimus Art. It is a Massachusetts company in which you send a box of art, even three dimensional pieces, and they will catalog each piece into a archival quality coffee table book. Each piece can also be titled and have a description. There are various packages, none of them super cheap… although in my opinion totally worth it! So storage is still necessary but once the book was created you could let go of the originals after all I cannot remember the last time I looked through my elementary art box but a book would be treasured over and over. A less expensive option would be to take a picture of your child with the artwork thus creating your own documentation to scrapbook or place in an album. 1. Gallery Frames: Buy a series of gallery frames in white or black. Ikea has great prices. Hang in an area of the house and change out the art, instead of pictures, as often as you would like. Remove the mattes for additional space! This is a more formal look, organized and pretty! 2. Art on a Wire: This option works great in a playroom setting. There are several options from Pottery Barn Kids, Land of Nod and even an Ikea cutain wire depending on your budget and aesthetic. If you are crafty you could even fashion your own from old drawer pulls and ribbon! 3. Art on a Rod: This idea is from Tiny Decor via Paperseed. Hand a curtain rod with curtain hooks, hand art from those hooks. Lovely presentation! Since Ava has officially begun art class I have decided that I would be more purposeful about including art into our weekly routine. Every other day we would do a small art project with one main objective: how to glue, finger paint, one color, stickers, a shape, explore a paint brush etc. So off I went and loaded up necessary items along with some of my favorites! Here is my priority list of art supplies for toddlers! All supplies can be found at Michael’s or Target. NEVER go to Michael’s without first printing a coupon online! They are always there 40-50% off one item saves a TON!!!! 2. Washable Crayola Markers: I use these very sparingly will ALL AGES but kids LOVE them! 4. Crayola water color paints: do not expect these to stay clean. The colors will get mixed but again they will love it! 5. Dot Paints: They are paints in a bottle with a round sponge on the end so that you just dot the paint onto the paper. A lot less messy and FUN! 6. Colored construction paper: I cut all the colors into various shapes and sizes of shapes and put them in a baggie ready for future projects! 8. Glue Stick: I prefer glue sticks to elmers although some projects need elmers! 9. PAPER! If you can find it white card stock works great for painting! ** yarn, puffs, stickers, foam stickers, stamps, coffee filters, tissue paper etc. are cherries on the sunday of exploration! I will always have Ava “sign” her work in crayon or marker. But I also found this melissa and doug rainbow stamp pad and letter A stamp so she can stamp her A just to have a fun final step to each work of art! Older children can also date and title their work! Ava began Gymboree art class! The teacher is great and the class is set up very developmentally appropriate. The first 8 min or so was free time with play dough, which Ava loved! Then we moved to the carpet for movement and parachute fun. Then back to the tables for art #1 creating a valentine train. When I asked Ava if we were going to make a train she said “truck”. She is still loving trucks. She put the glue on the shapes and I placed them to form the body of the truck. I asked her to glue down the wheels this was a challenge as it was her first experience with glue! I put the glue down and she stuck the wheels on the paper. She then put the heart stickers down. She was soooo over sitting at the table at this point which originally was a selling point! We moved back to the carpet for snack and story time in which the melt down began. She decided that she wanted to leave the Art room and play in the gym, AHH!!! I was worried about that! Eventually we made it back into art, missed the second project but got there for music and block time. I think once she gets the routine down she will love art class as much as play class but it will take persistence on my part! I have decided that this adventure is more about teaching her that fun can happen even when she does not get to choose every step… for my strong headed darling this will be a challenge but also I believe a good lesson and experience!